Clement C. Moore contributed four poems to The New-York Book of Poetry (New York: George Dearborn, 1837), one of which was A Visit from St Nicholas. 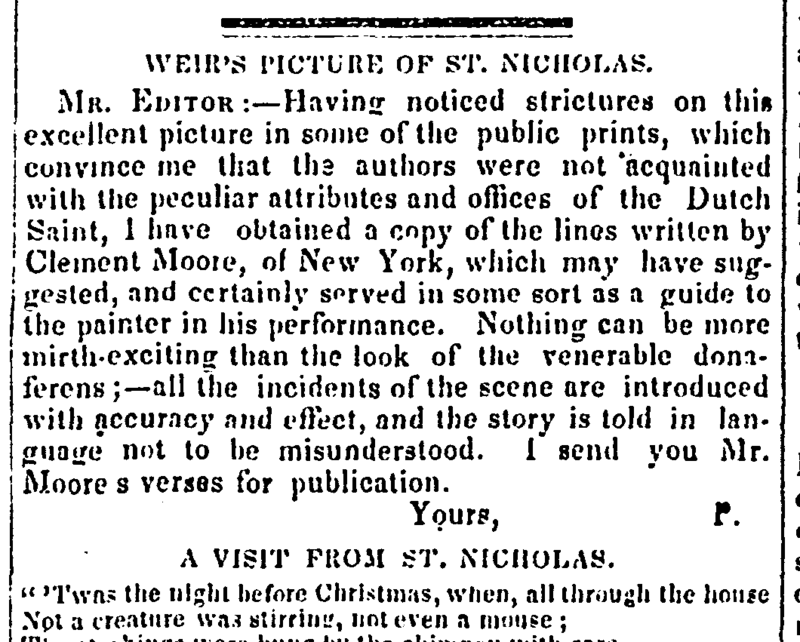 Moore's authorship of the beloved Christmas poem (aka "The Night Before Christmas") was already established when he affirmed his prior claim in a letter to the editor of the New York American, published March 1, 1844. LINES TO ST. NICHOLAS.— The following note from our friend C. C. Moore, the author of those lines which every child among us delights to hear, about Christmas, and which parents with not less delight recite, brings to our notice, one of the boldest acts of plagiarism of which we have any recollection. We ask the National Intelligencer to have the goodness to insert Mr. Moore's note—and if possible to elucidate the mistake, if such it be, or fraud attempted in respect of such well known lines. Dear Sir—My attention was, a few days ago, directed to the following communication, which appears in the National Intelligencer of the 25th of December last. 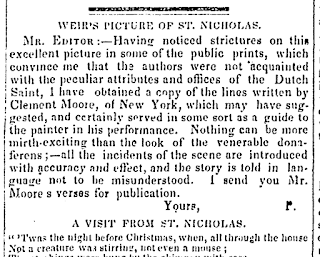 Gentlemen—The enclosed lines were written by Joseph Wood, artist, for the National Intelligencer, and published in that paper in 1827 or 1828, as you may perceive from your files. By republishing them, as the composition of Mr. Wood you will gratify one who has now few sources of pleasure left. Perhaps you may comply with this request, if it be only for 'auld lang syne.'" 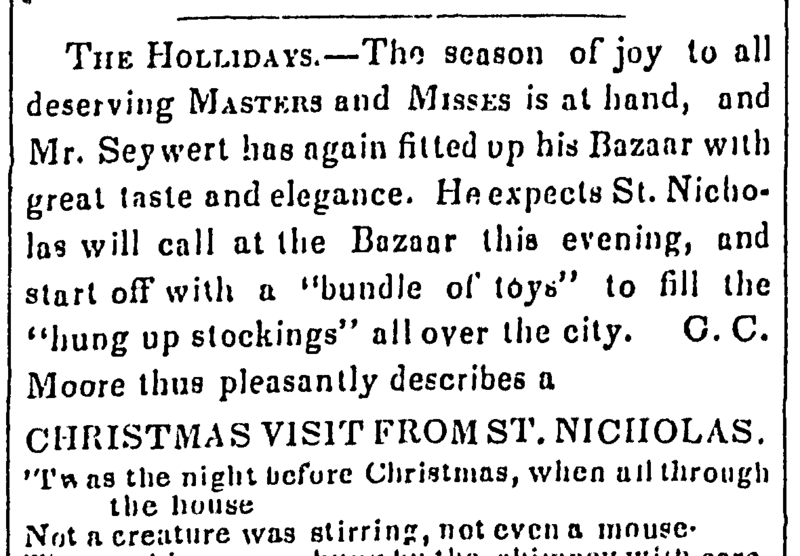 The above is printed immediately over some lines, describing a visit from St. Nicholas, which I wrote many years ago, I think somewhere between 1823 and 1824, not for publication, but to amuse my children. They, however, found their way, to my great surprise, in the Troy Sentinel: nor did I know, until lately, how they got there. When "The New York Book" was about to be published, I was applied to for some contribution to the work. Accordingly, I gave the publisher several pieces, among which was the "Visit from St. Nicholas." It was printed under my name, and has frequently since been republished, in your paper among others, with my name attached to it. Under these circumstances, I feel it incumbent on me not to remain silent, while so bold a claim, as the above quoted, is laid to my literary property, however small the intrinsic value of that property may be. The New York Book was published in 1827 . As stated in this 1844 letter, transcribed above, Moore was prompted to reassert his claim by a false attribution in the Washington National Intelligencer. When he wrote Charles King of the American on February 27, 1844, Moore did not know that the National Intelligencer had already corrected the error, as pointed out by the Washington editor on March 6, 1844. 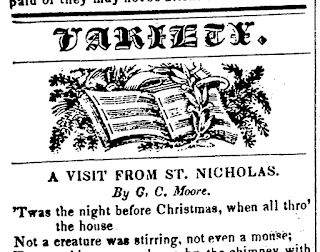 Moore subsequently included "A Visit from St. Nicholas" in his 1844 volume, Poems. Below are listed some of the earliest known attributions of "A Visit from St. Nicholas" to Clement C. Moore, all made before Moore published his 1844 book of Poems with "A Visit from St. Nicholas" on pages 124-7. 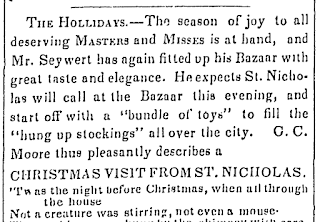 "A few days since the editors of the New York Courier, at the request of a lady, inserted some lines descriptive of one of the Christmas visits of that good old Dutch saint, St. Nicholas, and at the same time applied to our Albany neighbors for information as to the author. That information, we apprehend, the Albany editors cannot give. The lines were first published in this paper. They came to us from a manuscript in possession of a lady in this city. We have been given to understand that the author of them belongs by birth and residence to the city of New York, and that he is a gentleman of more merit as a scholar and a writer than many of more noisy pretensions. We republish the lines in a preceding column just as they originally appeared, because we still think of them as at first, and for the satisfaction of our brethren of the Courier, one of whom, at least, is an Arcadian." --Troy Sentinel, January 20, 1829; as quoted by Arthur James Weise in Troy's One Hundred Years (Troy, NY, 1891). Clement C. Moore's daughter Emily died in 1828, just six years old. In the year 1830 Moore lost his wife Eliza (d. 4 April 1830) and daughter Charity Elizabeth (d. 14 December 1830). Moore gave heartfelt poetic expression to his grief in a poem titled, To Southey. Any later recollection of Christmas joys experienced in 1822 when "A Visit from St. Nicholas" was originally composed would have been tempered by remembrance of lost loved ones. On Sunday evening, after a long illness, which she endured with Christian resignation and fortitude, Catherine Eliza, wife of Clement C. Moore. The friends and relations of the deceased, and of her husband, are respectfully invited to attend the funeral to-morrow afternoon, at 5 o'clock, from No. 1 Charlton-street. --New York American, Monday, April 5, 1830; reprinted in New York American for the Country on Friday, April 9, 1830. On Tuesday, the 14th instant, Charity Elizabeth, second daughter of Clement C. Moore. The friends of the family are respectfully invited to attend her funeral on Thursday, at 1 o'clock, P. M., from No. 1 Charlton street. "a figure called St. Nicholas who was robed in fur, and dressed according to the description of Prof. Moore in his poem." --quoted by Stephen Nissenbaum in The Battle For Christmas, fn 85, page 345. SANTA CLAUS, WITH HIS CHRISTMAS GIFTS. "As appropriate to the season, and because it has long circulated without a name, we also copy A Visit from St. Nicholas.--By Clement C. Moore." --New York American, December 31, 1836. The lines which follow have been much admired, and have appeared in a variety of publications, but never, we believe, before under the name of the real author--CLEMENT C. MOORE. --The American Monthly Magazine for January 1837. "CHRISTMAS. / A VISIT FROM ST. NICHOLAS. / [BY CLEMENT MOORE.]" --Nashville, Tennessee Republican Banner, January 5, 1838. "Poetry / A Visit from St Nicholas / By Professor Moore." --Columbia Democrat (Bloomsburg, Pennsylvania), January 6, 1838. 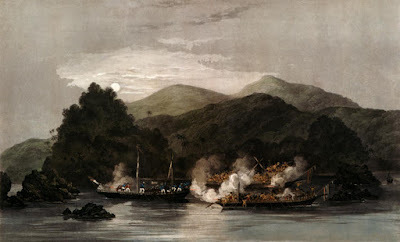 WEIR'S PICTURE OF ST. NICHOLAS. MR. EDITOR:--Having noticed strictures on this excellent picture in some of the public prints, which convince me that the authors were not acquainted with the particular attributes and offices of the Dutch Saint, I have obtained a copy of the lines written by Clement Moore, of New York, which may have suggested, and certainly served in some sort as a guide to the painter in his performance. Nothing can be more mirth-exciting than the look of the venerable dona-ferens;--all the incidents of the scene are introduced with accuracy and effect, and the story is told in language not to be misunderstood. I send you Mr. Moore's verses for publication. P. --Boston Weekly Messenger, September 26, 1838. The Vision of Rubeta by Laughton Osborn criticizes "the nursery rhymes of Prof. Moore" as "nonsense" and "trash." 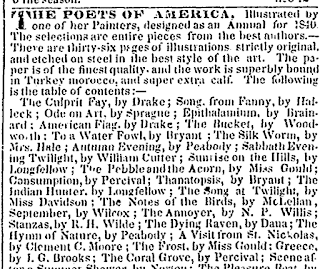 "THE POETS OF AMERICA, Illustrated by one of her Painters, designed as an Annual for 1840. 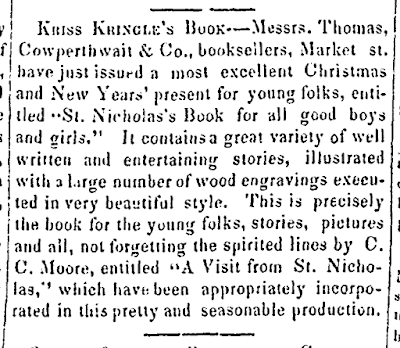 The selections are entire pieces from the best authors.--...The Culprit Fay, by Drake; Song, from Fanny, by Halleck...A Visit from St. Nicholas, by Clement C. Moore...." --New York Commercial Advertiser, December 19, 1839. 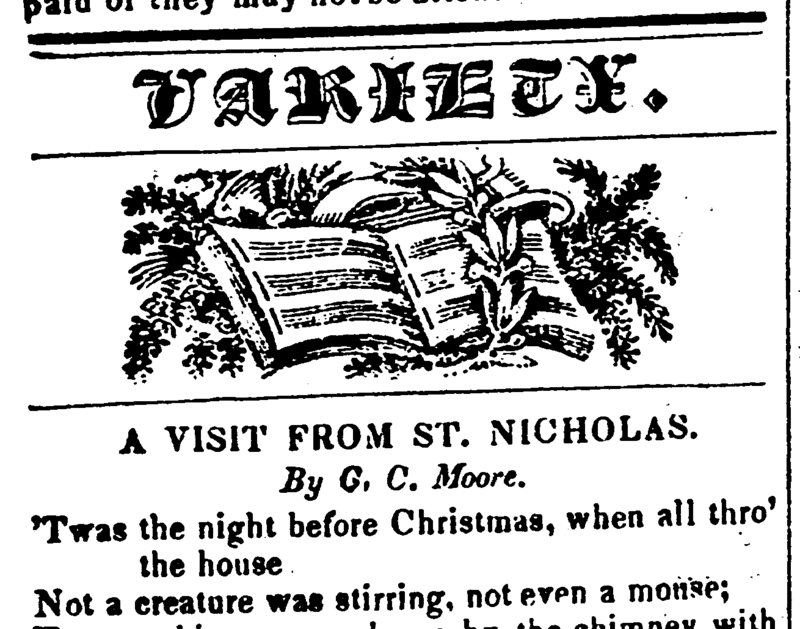 Two 1840 anthologies correctly attribute "A Visit from St. Nicholas" to Clement C. Moore. The Poets of America, edited by John Keese, credits "C. C. Moore" with authorship of "A Visit form St. Nicholas." 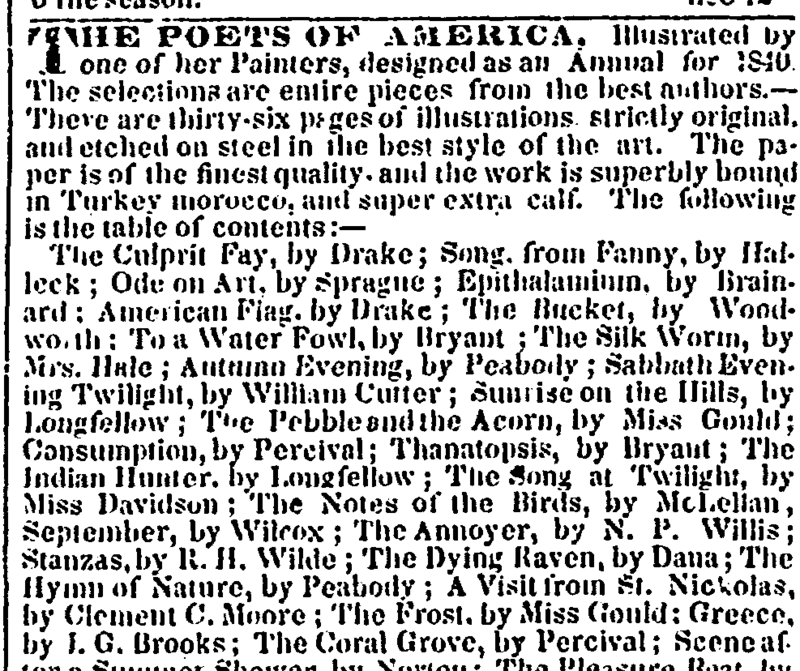 Another 1840 anthology, Selections from the American Poets (edited by William Cullen Bryant) reprinted "A Visit from St Nicholas" under the name of "Clement C. Moore." Not a creature was stirring, not even a mouse...."
"A Visit from St. Nicolas" reprinted with credit to "Clement C. Moore" in The Constitutionalist [Bath, New York], December 22, 1841. "KRISS KRINGLE'S BOOK.-- ... 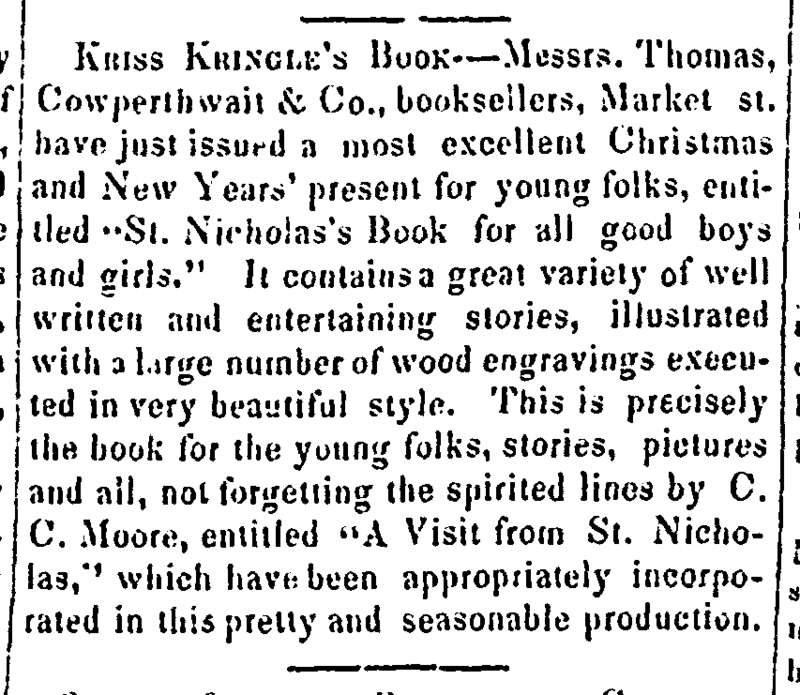 This is precisely the book for the young folks, stories, pictures and all, not forgetting the spirited lines by C. C. Moore, entitled "A Visit from St. Nicholas," which have been appropriately incorporated in this pretty and seasonable production." --Philadelphia Pennsylvanian, December 21, 1841. We add below the following sprightly and popular effusion of an American poet: A VISIT FROM ST. NICHOLAS. / By C. C. MOORE. -- Leesburg Genius of Liberty (Leesburg, Virginia), December 25, 1841 via NewspaperArchive. Messrs. EDITORS: I perceive in your paper of the 25th instant that an extract from the beautiful little poem entitled "A Visit from St. Nicholas" is given to the pen of Jos. Wood. This is a mistake. It is well known to be the production of CLEMENT C. MOORE, of the city of New York, and is published as his in the volume of American Poems edited by John Keese.